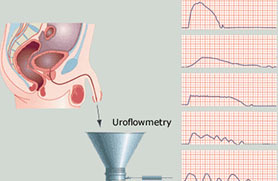 A urinary test flow is used to calculate the speed of urine flow. It is also used to check if the bladder is working. The urinary flow test is made up of a funnel connected to a measuring device into which patients are advised to urinate. The device will calculate the urine amount, length of time and rate of flow. The urinary flow test will check for bladder function. For example, in normal urination the urine stream will start slowly and speed up until the bladder is empty. If there is a blockage the pattern will change and this can be detected in the urinary flow test. It is a simple test that will give patients insight into their urinary tract system. It is often used to check for blockage. There are many health conditions that can cause a block in the urinary tract. A urinary test flow is safe and can be done in the privacy of your bathroom. However, we advise patients to discuss this option with a specialist doctor before proceeding with the test. There is no prior preparation before you take a urinary flow test. You may be advised to drink plenty of water to make certain the bladder is full. A urinary flow test is usually an outpatient procedure, although it may be done as part of an inpatient procedure. © 2018 | Dr. Shawket Alkhayal | All rights reserved.